I did mention earlier of my detox diet plan and eating healthy for a period of time.Then again after some serious sunshine and a sudden heavy unexpected downpour- I took refuge in a place away from home in Baba’s Wood Cafe ‘Da Maria’. I love all things Italian- The cars, the bikes, the women, the fashion and of course the food (at times not necessarily in that order.) And Mariagrazia Raschi with her welcoming Italian hospitality makes one feel at home the minute one steps in. For all those living under a shell- they have shifted to Miramar and are right above Bina Punjani Hair Studio. With the thunderous roar and thrashing showers (which I barely managed to escape- thankfully bone dry) I found myself staring at Sofia Loren (not in person, f course) in her early 20’s preparing Spaghetti cacio e pepe from a still of her movie La Ciociara (Two Women- 1960). A gorgeous photograph resonating the quintessential focus of a ‘trattoria’, which Mariagrazia proudly advocates. Its home style cooking with fresh ingredients- satisfies the senses every single time. But for a minute, leave Sofia be and let’s focus on what Mariagrazia brings to the table. She thought a nice shot of brandy would cheer me up. And known for my love for all things sweet she asks me to try out her latest creation- Coppa Amaretto & chocolate. As exotic as it appears and sounds- it is rather simplistic in nature. Lets deconstruct shall we? 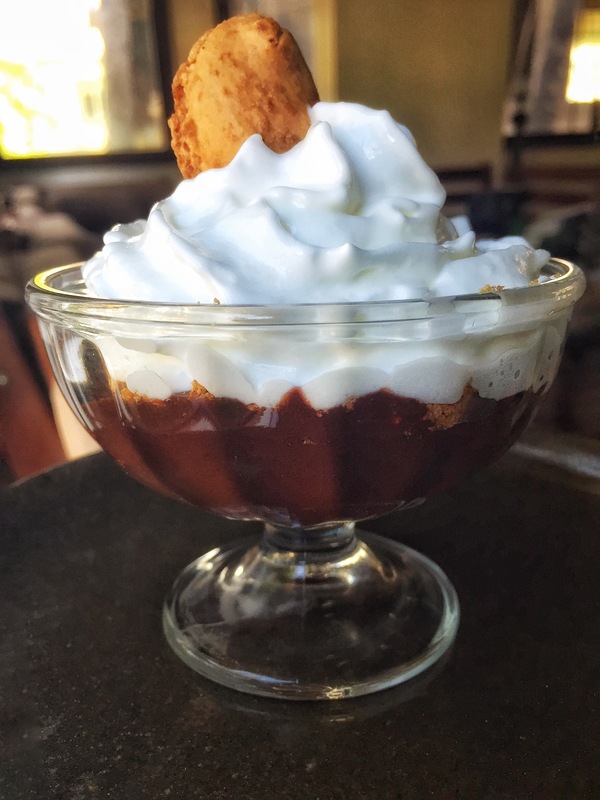 A gooey free flowing chocolate mousse interspersed with crunchy amaretti biscotti layered with a slug of brandy topped with fresh whipped cream.Simple enough to make you drool? The portion is huge. A suggestion would be to share even for the voracious appetite. Its sinful indulgence. You make a fool of yourself trying to consume the remnant stains of mousse that holds dear to the spoon taunting you to slurp some more to show its chrome beneath. The fresh cream sends you into a heady tizzy like a walk in the clouds both in color and texture. A delightful chore indeed but in the end so worth it. Did you know? Legend has it, the invention of this amaretto has received an amorous Renaissance treatment. In the early 18th century, a Milanese bishop or cardinal surprised the town of Saronno with a visit. A young couple – residents of the town, welcomed him and paid tribute with an original confection: on the spur of the moment, they had baked biscuits made of sugar, egg whites, and crushed apricot kernels or almonds.These so pleased the visiting bishop that he blessed the two with a happy and lifelong marriage, resulting in the preservation of the secret recipe over many generations. Thank you rain gods to drive me into the arms of two amazing Italian women to share a coppa to the melody of the falling rain outside.